At the same time, there is evidence to suggest some polyphenols in apples can lower the ability of cavity-causing bacteria to adhere to teeth. Polyphenols contain micronutrients that are beneficial to the body. These molecules are related to antioxidants, which fight against cell damage and promote healthier life. Further, some studies have shown that the antioxidants in apples can help prevent periodontal disease. Apples even contain a (very) small amount of fluoride. This is worth noting, as fluoride is so important in helping prevent cavities. Lastly, the act of chewing an apple stimulates saliva production. Saliva helps wash away food debris and bacteria. 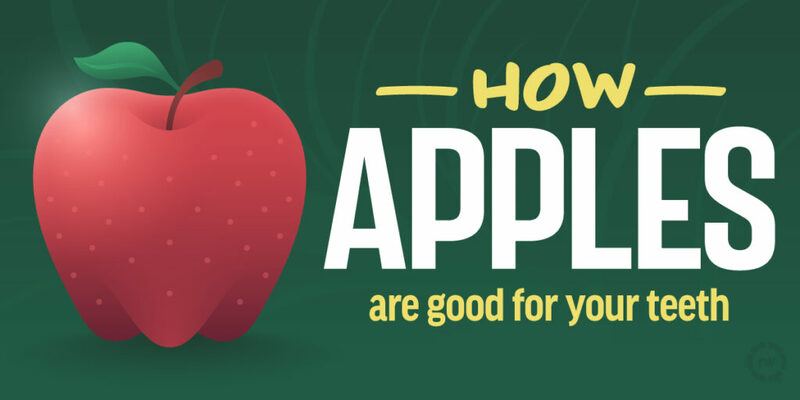 Remember, though, apples contain sugar and acid so it’s best not to go overboard with them. You can even swish with water after eating one to wash away some of the sugar left behind. As the science continues to look into how apples affect our teeth, one thing we know is true: regular dental visits, along with daily tooth brushing and flossing, is your best defense against tooth decay! At All Smiles Pediatric Dentistry, we incorporate proven techniques to share with you and your child at each dental checkup visit. Dr. Allen Job and his team are committed to providing the latest in oral health care prevention. For more information about improving your child's oral health check out our preventive dentistry page. Still want more information? Check out our monthly blog posts! Our practice is centrally located in San Diego, CA. Get acquainted with us by watching our practice video and find out what we do. Scheduling an appointment for your child is easy! Start here to schedule an appointment. All of our forms are online. Fill them out securely from your smartphone or tablet and hit send. On appointment day, your child will be seen at their scheduled time. For example, if you have a 9:00 AM appointment, your child will be seen at 9:00 AM. Dr. Allen Job, DDS, MS, MPH, MS is a board certified pediatric dentist who practices in San Diego, California, where he specializes in prevention. He is also an assistant professor at Loma Linda University Department of Pediatric Dentistry. "This is an awesome office. The staff is always friendly and Dr. Job is the best. I would recommend anyone with kids to bring them to this office you would not be disappointed."